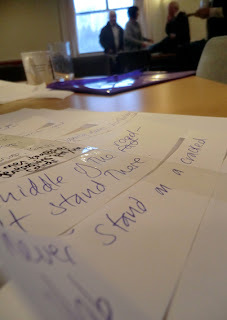 We are starting to flesh out our plans for the forthcoming project the warm /&/ the Cold. One element is the gathering of fabrics for the quilts, at the weekend I filled the boot of my car with donated blankets from Branwen a very generous member of Freegle. The V&A exhibition in 2010 of quilts was one of the museums most successful exhibitions. 'Quilts are comforting, intriguing, intimate and heavy with history' (Perri Lewis) The show showed historical and contemporary pieces by artists such as Grayson Perry, Tracy Emin, Jo Budd. In a project where the majority of the participants will be men (70 percent of homeless people are men) its fascinating to read about 'mens quilts'. 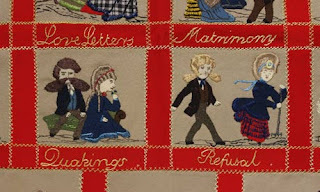 Historically soldiers were encouraged to take up embroidery to stop them drinking and gambling and made military quilts. 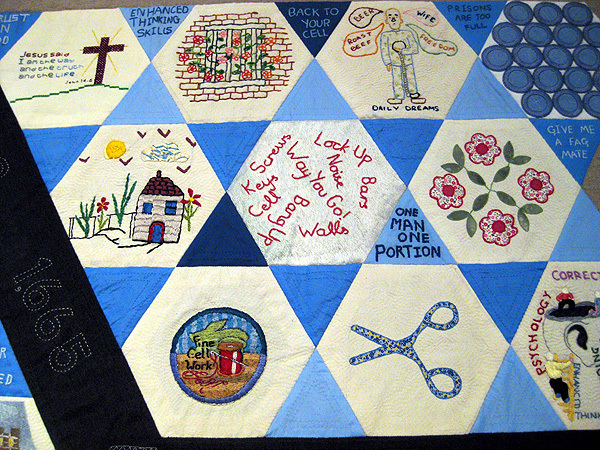 The all male quilting group in HMP Wandsworth made a quilt to articulate the reality and experience of incarceration through stitch. and of course there's Lynn Setterington who will be giving us all a masterclass in quilt making later in the project. arthur+martha is working at a 'Buddy Cafe' for people diagnosed with dementia - and their carers - in Salford. We're bringing together the stories of the many people involved. Some of these pieces will be interviews, others creative work. 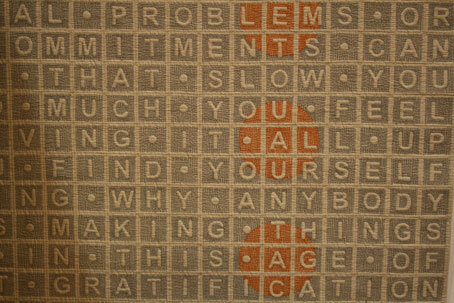 We're trying to trace paths through the jargon and confusion, towards understanding. This project is in partnership with Age Concern Salford and Salford PCT. In this interview (part 2 of 2) Becky who cares for her dad (diagnosed with Early Onset Dementia) describes the impact that caring has on her life and place in the world. At the moment I’m managing my dad’s care, we don’t need someone in to cook, or extra help yet. But what would happen if I got a full time job. I wake up sometimes and think if I didn’t care for him who would. Yesterday I found out about some services I didn’t know existed. Crossroads (http://www.crossroads.org.uk) and Telecare. ( http://www.telecare.org.uk ) And I can Always pick the phone up and Age Concern are there to help and point me in the right direction if they can’t help. I’ve been off my antidepressants for a year now, an amazing feeling to do it even with all the things going on. I feel like I’m in a catch 22 situation. I can’t get a full time job because I can’t leave my dad alone- I’d spend all day at work worrying- has he turned the oven off, the tap off… I can’t move out because I haven’t a full time job. Got to have a sense of humur with him. My patience has grown very quickly. I don’t sit there and say you’ve told me that three times already. I get to spend a lot of time with him, even if its not the dad I grew up with. It’s hard work but rewarding that I know what I do helps my dad have a better quality of life. Because I take a lot of stress, he has a better quality of life. I’m young. I can take it. It has become the norm. If I had time off I would spend all my time worrying. I spent time with my church and the Beavers Group. It lets me out of my own head for a while. I can’t believe this is actually my life. In this interview (part 1 of 2) Becky who cares for her dad (diagnosed with Early Onset Dementia) describes the impact that caring has on her life and place in the world. I went to a carers course the other day, I felt a bit out of place- being the youngest. Everyone else had a bit more life experience. I was thrown into caring and didn’t really want to do it. 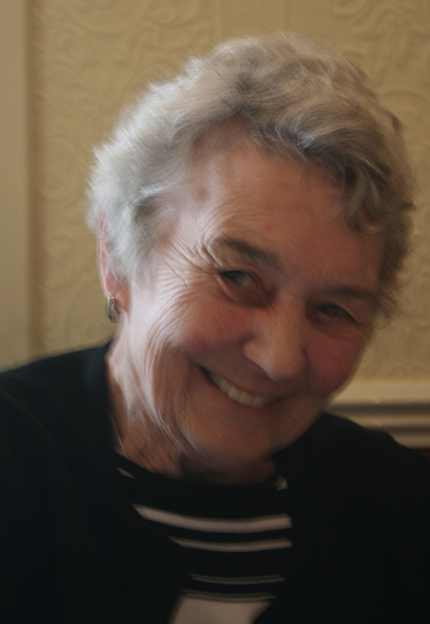 Mum used to be dads carer, but she passed away nearly two years ago, so I do most of me dads care. 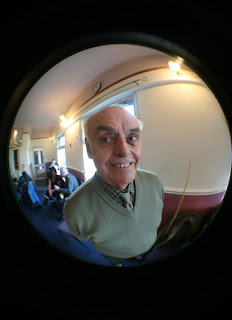 I’ve been fascinated by watching the whole group this morning (at the Buddies Café) its been an eye opener- there are people here further along the scale of dementia than my dad. To be honest I felt a bit scared seeing this, if this is where we’re going in a couple of years I’ll go crazy. I’m 24 and been caring for my dad for two years. You can gradually see it getting worse. He was first diagnosed when I was coming out of University. I had just graduated as a teacher. My mum struggled, so I had to get a job as a nursery nurse to fit around it and help out. I found out about the services available to people with dementia after me dad came to this group. I had no idea of the services at the beginning, I didn’t know anything, didn’t know who to contact or even what dementia was. I had to go to the library; I had no idea of what I was dealing with. It took months and months to get a diagnosis (and that was on top of a stressful 3rd year at University) and then another year before we got a proper diagnosis. When we got it my Aunt Vera helped me mum to find the proper services. When we contacted them they were really helpful, but we didn’t really know they existed before. Over 1000 people in Salford are diagnosed with Dementia, I was absolutely shocked when I heard that. Considering how good the services are, they aren’t signposted. The GPs didn’t really help. Once you know the services are there, they help and they point you in another direction when you need it. At the time I didn’t consider Age Concern. A 54 year old man, I didn’t expect Age Concern would be appropriate. I get a lot of comfort from my Church, they all know dad’s not quite right, they say if he says something odd, to ignore it. I don’t feel judged by them, they sit and listen. It’s just life now. I can see why someone new to it might find it taboo, but to me its just life. Below is the second conversation noted down with Mr. Pickering at the Buddy Café, Salford. 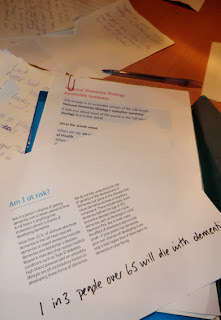 These interviews will form part of a collection of work which will include poems and artworks, finding creative ways to inform us of life with dementia and as carers. A tip on memory, I always find it very difficult. I try to select something I’m ‘convenient’ with. (I don’t want that word, that’s when I fall apart, time has worn it away and left me with Margaret, who is everything to me. If it wasn’t for her I would be nothing. At one time I got upset, I do my best now. I say ‘sorry, I can’t oblige now, my wife isn’t here.’ In that way I divert it. But I know it doesn’t sound good. I work straight at it, whatever it is I work straight at it- I’m not always correct. I’m relying on the quality of my wife. I’ve found services a little on the poor side. Doctors always seem to busy, there’s always queuing up, a bit of a disappointment. The diagnosis was very smooth and easy. In my book there wasn’t much need- My memory had just slowed down, my wife took over. Margaret was starting to be a bit unwell, but hid it away, she’s very intelligent. We in here (The Buddy Café) have helped in these little circles now. Coming here, the group of people I’ve known for several years. Take that coloured gent over there, a real gent, we work like a team. Friendship, without a shadow of a doubt- friendship by helping. Some people when coming in here are very poorly. Advising if required. At first its not helpful, we introduce ourselves, then it can grow. All these people, I can’t remember their names, that’s a blow. I can remember mine though. You can do it with care, that’s the secrete to do this kind of thing, it helps the person. Its beneficial sometimes to slow down, that’s my line of the problem. arthur+martha is working at a 'Buddy Cafe' for people diagnosed with dementia - and their carers - in Salford. We're bringing together the stories of the many folk involved. Some of these pieces will be interviews, others creative work. We're trying to trace paths through the jargon and confusion, towards understanding. This project is in partnership with Age Concern Salford and Salford PCT. 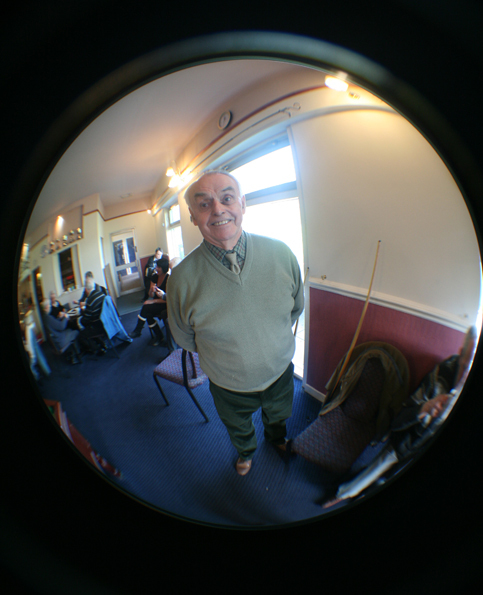 In this interview, the extraordinary Fred describes his experience of dementia. His language has been affected by the disease, but he uses this 'changed' language to very eloquently describe life from within the condition. Dignity and acceptance rings through the following short discussion, humour too. Fred has a very sparkly demeanor, with which he counters considerable sadness and difficulty. “Whatever happens, it's worth a little laugh. “This condition, it can be different degrees, depending on the pressure of the people in the surround. It falls on me. I didn't HAVE a fall – it falls ON me. I try to give my best and give a little strength so they are not disappointed. When I'm at home sometimes I find it difficult and there doesn't seem to be any answer. Later in the day, my brain sees something. A friend calls or something brightens me up. Sometimes bright as a button and strangers can't tell I'm in that condition. “Doctors listen in varying levels. But they don't hold in a regular style as I call it, so I leave them with no information. Mostly they're good. “Early childhood I remember a little. Could have been four or five. Better when 15 or 16, that's what I think I remember best. But whose memory's failing? “I got married. A good idea, marvellous. Margaret! “This condition, it went worse over a 20 year period. I lost me, it edged away. But Margaret was brilliant, clever. I was only the teacher. The following is a conversation noted down at the Buddy Cafe, Salford with a carer whose brother has a dementia diagnosis. 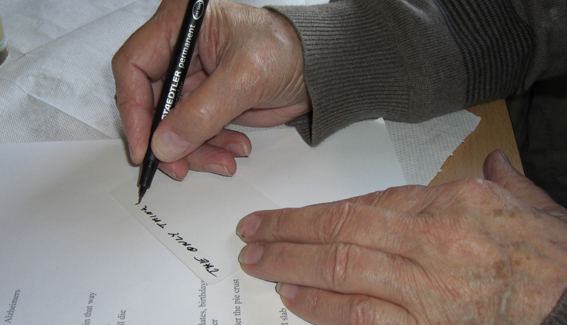 These interviews will form part of a collection of work which will include poems and artworks, finding creative ways to inform us of life with dementia and as a carer. What I found difficult watching was the stresses and strains on D's family, waiting to find the diagnosis. Whilst you're waiting for the diagnosis, you can't get benefits, not the right benefits anyway. It took too long, it took 12 months to get a diagnosis. He had a couple of strokes, they demoted him at work, then made him redundant. It was unfair dismissal, they said he was a danger to the firm - they should've pensioned him off. He had to sign on for Job Seekers, but he wasn't fit to work. He wasn't fit to apply for jobs, his wife was having to apply on his behalf for jobs he couldn't do anyway. The stresses it put on the family, he should have been on the sick. Over three years ago he was diagnosed and this Saturday, they sent him for a medical to prove he could still get his benefits. His doctor said it was obvious he wouldn't be working again. The stress of the benefits, and he would just say he's ok if asked. My dad's had strokes too, been like that for 11 years, so I'm used to it. I've got closer to my dad since it happened and closer to D. I've learnt about him, his history, his lifestyle. My brother is only 57 now, 54 when it started. I always thought dementia was a older person's disease. I worked in Neuro Surgery, so I picked up a lot with his wife early. I worry because I have memory problems. I had a mini-stroke 5 years ago, I have Fibromyalgia as well. Sometimes I look at D and say: 'I haven't got dementia have I?' Our great grandmother she was 88, she had it. I'd like to know more about the genetics. The dementia won't kill him, I just don't want to see him go to the state of not knowing what's going on around him. People think its easy being a carer. It's not, it's 24/7. I've seen the stress on his daughters. When I'm well I help. I need distraction, have a laugh, feel like I'm doing something. I'm learning from them. 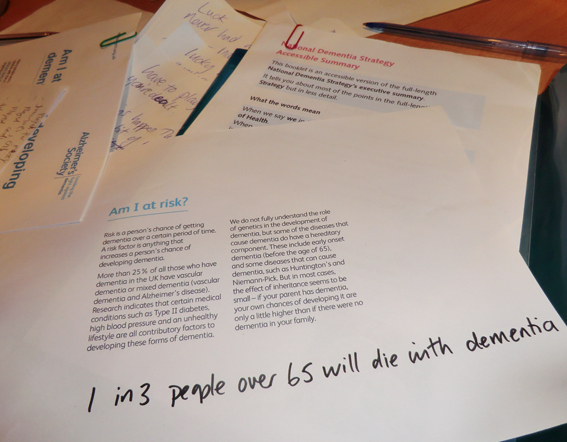 Learning about dementia, about their past, how these people lived their lives. They're human beings: the young have a lot to learn from them. A lot of people have turned their back on D, he doesn't have many friends anymore - they're embarrassed? I can't speak for them. The GPs have been very good, and the practice nurse, because they know him. They should automatically get their D.L.A. it shuld be easier for them to get their benefits for life, to save the stress for the whole family. I just treat D normally, he's just my brother, to be honest we didn't even get on when we were younger, he was always a man's man. My dad's good with him, they're the same. I've had a lot of fun here, lots of laughter, that's why I come back. Children accept the dementia, it's just normal to them. You want to protect them. A lot of people ignore it or pretend it's not there. I know I'm contradicting myself as I treat D as normal, but I know it's there. I don't treat him like an idiot. D can be hard work, but he just wants company, especially since his wife died. Imagine bringing your children up, then your wife dies and you have got this disease. I worry about that, what's going to happen to him. I can't physically look after him, I've got my own health needs. But I wouldn't change any of it. The way I am with him - I wouldn't not be involved. Sad, it's sad. But I wouldn't change it, because at least I know I've tried. It's about quality of life. It's about him having a good quality of life while he can. Last week we followed on from poetry the group had written the previous week and used some of the words and thoughts from these texts to inspire pierced paper works. Stemming from Blackpool's illuminations have been various ideas about light and Phil had an especially nice idea he called constellations; mapping yourself in a diagram as a personal solar system. For these works on black paper we used needles, awls, knives and pins to cut and pierce the paper, deciding where light would shine through. The beauty of these will probably only be fully clear when I photograph them with a lightbox, but even passed in front of the huge skylights they twinkled curiously, giving hints of the imagery. Some of the words and images included fountains, eyes, lights, stars, hearts and words. Each person produced something very different. I don't buy the idea that creativity is automatically 'good'. I think that these things are processes that run deep and unbeknownst, like dream-life stringing out on the ocean floor. 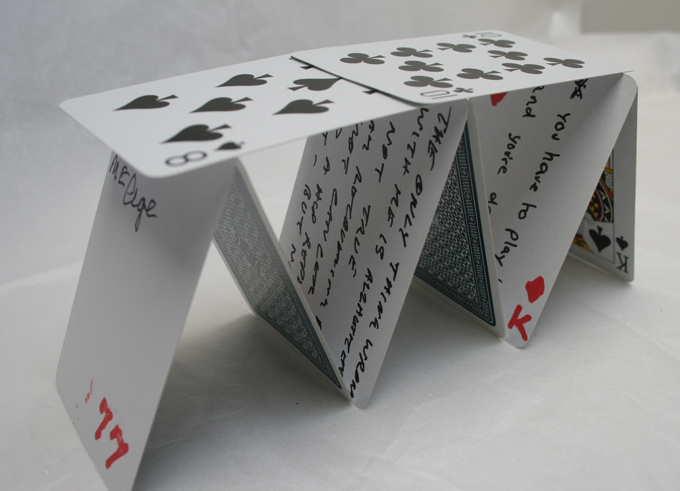 I also think that the act of making can foster delusion, selfishness, and a forensic distance from our own hearts. But it also offers connection and catharsis – maybe one downside is the price of the other side's up. I'm delighted that he could take something from our little creative expedition and use it to make changes in his own life. However, the aftershock of these big conversations can be unsettling. I told him to be kind to himself this week, if he possibly could. I told him that he deserved a medal. Some of the biggest, brightest acts of courage I've witnessed are almost invisible to the greater world. This group poem was made by intercutting conversations at the Salford Buddy Cafe about luck and chance, with information about dementia taken from a factsheet 'Am I at risk of developing dementia' (available to download from the Alzheimer's Society website). Conversations were noted and cut up with scissors; the lines were then arranged and edited by participants, particularly Dave and Shirley. What strikes me loudest and deepest is the humour and complete lack of self-pity in these words. "tha knows what I mean"
"in the yard, where's your's?" We're delighted to announce that the warm /&/ the cold our new project with homeless people will start shortly. 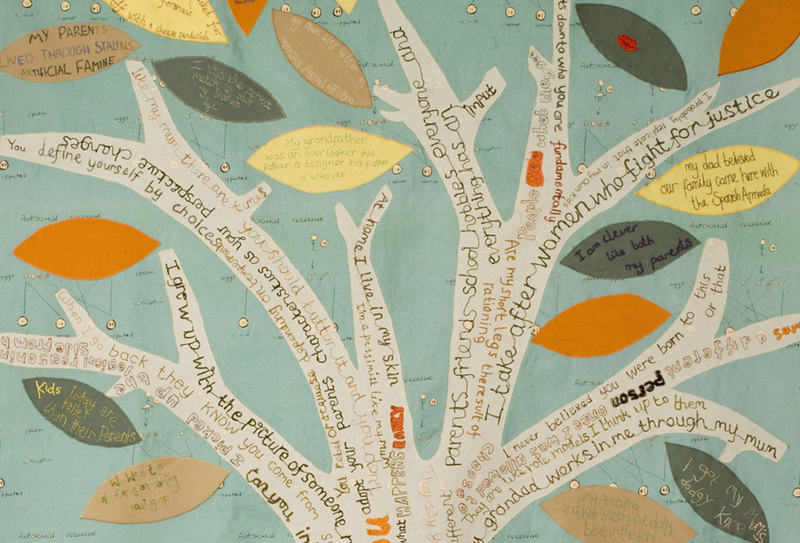 Homeless people in Manchester will devise poetry about their lives and inscribe it onto mugs and quilts; these pieces will have a practical, personal use but will also be exhibited to a large audience public TV screens. Homelessness is one of the most feared and reviled roles in our society, but it is also a growing problem in this time of economic hardship. This project will help homeless people in Manchester develop new life skills, socialise and build confidence. Additionally, the pieces will challenge preconceptions about homelessness, combating hate crime against homeless people and emphasizing needs shared by us all – especially the need for shelter. Pieces will additionally be featured in The Big Issue magazine, exhibited at homeless drop-ins in Bury and Manchester and serialized as an ongoing epic twitter poem. This will further increase public awareness of the project. 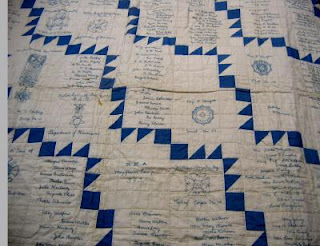 Embroidery students at MMU will help participants to sew the quilts, developing another set of creative/interpersonal dialogues. This project will work in partnership with drop-in-centres for the homeless: The Red Door in Bury and The Booth Centre, Manchester, and The Big Issue office. Sessions will also take place on the street. The project has received funding from Arts Council England and Bury Arts Service. It is partnered by the the Booth Centre, Big Issue, BBC, Salford University Media Department, Manchester Metropolitan University Embroidery Department and will continue our long association with Bury MBC. It's all unknowns, I've never experienced any of this before. It's my first time experiencing dementia. Is this what to expect? Is this normal for Lewy Body dementia? My son's GP didn't know, they hadn't even heard of Lewy Bodys Disease. You can't see people have dementia - it's not tattooed across his forehead, I know, we know, but they don't. Into the unknown. When Ray was first diagnosed I didn't know about the disease, never even heard of it. There's something different everyday. Yesterday he developed a kind of phobia, he was stood behind me all the time, following me around. Other times he blanks me, won't answer me. The illness changes the behavior and the personality - it's difficult to know how much is the illness and how much is it just the person being awkward. Like in the song, "You always hurt the one you love..." It's always me, not my children. I can weep buckets for nothing, something said and that's it. If I feel I'm going to cry, I go upstairs and cry on my own. If I cry in front of Ray, he ignores it, walks away. Then he comes back and says 'Do we want a cup of tea?' He knows its him who's upset me. It's not like him, not like he used to be. Now he ignores a lot of things. He doesn't know how to apologize anymore, he's completely different as far as I'm concerned, not to other people - just to me. At the beginning I knew there was something wrong, but it took a while to get a diagnosis. 'and a bucket of water for the horse too'... its so embarrassing when he says it and people don't understand it. At the beginning I knew he wasn't right he was doing things differently - not eating properly, wasn't using his knife and fork, was picking things up like his Sunday lunch- picking up his Yorkshire pudding with his fingers and showing a bit of aggression when we asked why. We talked him into going to the doctor, little changes not acting normally. If you said don't do that, he'd do it more just to annoy you. That's how it started. The doctor said we'll examine you, get a scan, see what's happening. They thought at first it was just Parkinson's, they assessed him on his own. Told me to take another member of the family with me so we could pick it all up. Got to see Dr M, that's when she said that your brain is in sections, and there's one section leaking into another and it shouldn't. She explained all this and he should stop driving and all this. He didn't want to, been driving all his life. His insurance wouldn't cover it. It took 8 months before he got rid of the car. I wouldn't let him take the grandchildren with him, I'd go in though, be frightened sometimes. Got to get used to it. I can't praise Age Concern enough. They come to your house, help you with everything. And go on a carers course, we laugh together and cry together. We go to the meetings once a month. When I first went to a carer's course, everything felt lifted. It's all the unknowns; you go to the carers and everyone bares their souls. It's like what you see on telly with the Alcohol Anonymous - what's said in that room stays there. It's really uplifting, I can't praise it enough. Opens your eyes to what's in front of you. To talk openly about it all. My children say 'But he's ill.' I know he's ill, but it doesn't stop any of it. What advice would I give? Join one of the groups right away- that prepares you for all the stages that's ahead of you. You've got to go, that's where you get your help and info from.